Baltimore Ravens running back Justin Forsett and his wife welcomed son, Zion, to the world on Valentine’s Day. Zion is the couple’s second child. Forsett and his wife, Michelle, were on their way to a Lauryn Hill concert in Washington Saturday night when Michelle went into labor. The couple were forced to drive to the hospital in a snowstorm and Forsett thought he would have to deliver the baby in the car. 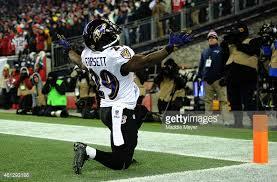 Set to be a free agent on March 10, Forsett finished fifth in the NFL in rushing after expecting to back up Ray Rice who spent the season suspended by the league. Look for Forsett to cash in big on the free agent market as he is the best running back available not named Murray. Please visit http://thegamedayreport.com for more of my articles and some by other writers on a variety of trending topics.